Mitochondria play a critical role in metabolic homeostasis of a cell. 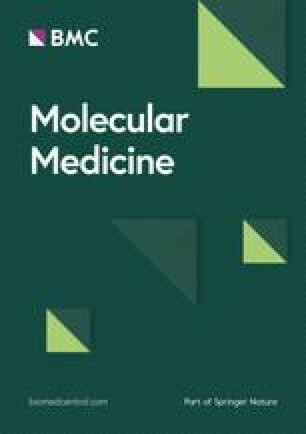 Our recent studies, based on the reported interrelationship between c-Myc and Sirt1 (mammalian orthologue of yeast sir2 [silent information regulator 2]) expression and their role in mitochondrial biogenesis and function, demonstrated a significant downregulation of Sirt1 protein expression and an upregulation of c-Myc following trauma-hemorrhage (T-H). Activators of Sirt1 are known to improve mitochondrial function and the naturally occurring polyphenol resveratrol (RSV) has been shown to significantly increase Sirt1 activity by increasing its affinity to both NAD+ and the acetylated substrate. 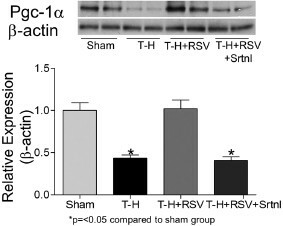 In this study we tested the salutary effect of RSV following T-H and its influence on Sirt1 expression. Rats were subjected to T-H or sham operation. RSV (8 mg/kg body weight, intravenously) or vehicle was administered 10 min after the onset of resuscitation, and the rats were killed 2 h following resuscitation. Sirtinol, a Sirt1 inhibitor, was administered 5 min prior to RSV administration. Cardiac contractility (±dP/dt) was measured and heart tissue was tested for Sirt1, Pgc-1α, c-Myc, cytosolic cytochrome C expression and ATP level. Left ventricular function, after T-H, was improved (P < 0.05) following RSV treatment, with significantly elevated expression of Sirt1 (P < 0.05) and Pgc-1α (P < 0.05), and decreased c-Myc (P < 0.05). We also observed significantly higher cardiac ATP content, declined cytosolic cytochrome C and decreased plasma tumor necrosis factor-α in the T-H-RSV group. The salutary effect due to RSV was abolished by sirtinol, indicating a Sirtl-mediated effect. We conclude that RSV may be a useful adjunct to resuscitation fluid following T-H. Severe hemorrhage leads to whole-body tissue hypoxia. Hemorrhagic shock also causes decreased cardiac output, stroke volume and cardiac contractility (±dP/dt) (1, 2, 3). Hypoxia and reperfusion injury result in dysregulation of critical molecular pathways and bioprocesses (4, 5, 6, 7, 8, 9). The predominant causes for mortality following hemorrhagic shock are sepsis and multiple organ failure (10). Among the major biochemical mediators implicated in tissue injury following hemorrhagic shock/resuscitation are reactive oxygen species (ROS) (11, 12, 13). ROS mediate immune alteration and mitochondrial damage, the latter initiating a vicious cycle generating more ROS. Decreased cellular ATP content and increased cytosolic cytochrome c observed following severe hemorrhage were consistent with mitochondrial dysfunction (14,15). Therefore methods to reduce oxidant-induced injury are important steps toward controlling hemorrhage-induced tissue damage. The antioxidant resveratrol (RSV) has been successfully used to reduce oxidative damage and inflammation in animal models of several human diseases (16). RSV, 3,5,4-tribydroxystilbene, is a natural polyphenol found in several species of plants including grapevines (Vitis vinifera). The term “French Paradox” was coined to describe the inverse relation between morbidity related to coronary heart disease and the predominant red wine consumption seen in France (17). RSV has been shown to increase lifespan (18,19) confer vasoprotection (20), modulate vascular inflammation (21) and reduce myocardial ischemia-reperfusion injury (22,23). The deregulation of mitochondrial function and enhanced production of ROS are hallmarks of injury, and RSV is known to improve mitochondrial function and decrease the generation of ROS (24, 25, 26). The major pathways by which the multitude of biological effects attributed to RSV occur include activation of Sirt1 and AMPK (24,27,28). Our previous studies have clearly demonstrated an increased expression of c-Myc following trauma-hemorrhage (T-H) irrespective of the age of the animals, possibly linking c-Myc to injury independent of age (29). c-Myc is also known to regulate Sirt1, and the experiments demonstrated a decreased expression of Sirt1 following injury (15). This observation led us to test the effect of RSV on left ventricular function and Sirt1 expression. Male Sprague Dawley rats (250–300 g) were obtained from Charles River Laboratory (Wilmington, MA, USA). Animals were housed in the experimental animal facility at the University of Alabama at Birmingham (UAB). Experiments including surgical procedures conducted on the animals were approved by the Institutional Animal Care and Use Committee at UAB and as per the guidelines of the National Institutes of Health. Rats were subjected to hemorrhage or sham operation as described earlier (5). The rats fasted overnight (water allowed ad lib) and then were anesthetized with isoflurane (Minrad, Bethlehem, PA, USA) and restrained in a supine position, before surgery. In both sham and T-H rats, a 5-cm midline laparotomy was performed to induce trauma, and the incision was closed asceptically in 2 layers with sutures (Ethilon 6/0; Ethicon, Somerville, NJ, USA). Polyethylene-10 tubing (Becton Dickinson, Sparks, MD, USA) was used to aseptically cannulate the right femoral vein and both femoral arteries of the T-H rats and blood pressure was continuously monitored by attaching one of the catheters to a blood pressure analyzer (Digi-Med BPA-190; Micro-Med Inc., Louisville, KY, USA). Upon awakening, animals were bled rapidly through the other arterial catheter to a mean arterial blood pressure of 35 ± 5 mmHg within the first 10 min of bleeding. Thereafter the bleeding was continued slowly for about 45 min, removing a total of 60% blood volume. For the next 45 min the animals were maintained at that low blood pressure to keep them in a state of shock. During the shock stage, 40% of the shed blood volume was given as Ringer lactate in small volumes. After this, the rats were resuscitated with four times the shed blood volume in the form of lactated Ringer solution over 60 min. The same surgical procedures were carried out on sham-operated animals, but they did not undergo hemorrhage or resuscitation. Two hours following resuscitation, left ventricular performance was measured and plasma collected; the animals were then euthanized and tissues removed. Four to six animals were used in each group. Left ventricular performance was measured by assessing left ventricular contractility. Briefly, rats were anesthetized by isofluorane and a PE-50 catheter was inserted into the left ventricle through the carotid artery. Positive and negative maximum dP/dt (+dP/dt and −dP/dt) were measured. RSV and sirtinol were purchased from Sigma Chemical Company (St. Louis, MO, USA). RSV and sirtinol were administered as a 150-µL solution in diluted DMSO (saline:DMSO, 2:1) intravenously. RSV was administered at 10 min from the start of resuscitation and sirtinol was administered 5 min prior to RSV administration. DMSO was administered as vehicle control. The dose of RSV was 8 mg/kg and the dose of sirtinol was 1 mg/kg body weight. Cytochrome c was quantified by Western blot with the use of the cytosolic fraction of left ventricular tissues prepared with a tissue mitochondrial isolation kit (Thermo Scientific, Chicago, IL, USA) (15). Western Blot was carried out as described (30). Briefly, total proteins from tissue lysates, nuclear extracts or cytosolic fractions were resolved using 4%–12% Nupage gel (Invitrogen, Carlsbad, CA, USA) and transferred to polyvinylidene difluoride membranes. After the membranes were blocked (10 mmol/L Tris, 150 mmol/L NaCl, and 0.05% Tween-20 supplemented with 5% dry milk) for 1 h at room temperature, they were incubated with the respective primary antibodies: Sirt1 (Santa Cruz Biotechnology, Santa Cruz, CA, USA), cytochrome c (Cell Signaling, Carlsbad, CA, USA), Pgc-1α (Santa Cruz Biotechnology) or β-actin (Abcam Inc, Cambridge, MA, USA). The membranes were then washed five times with Tris-buffered saline supplemented with 0.05% Tween-20 (TBST). Appropriate secondary antibody (Santa Cruz Biotechnology) conjugated with horseradish peroxidase was incubated with the membrane for 1 h, washed with TBST, probed by use of enhanced chemiluminescence (Amersham, Piscataway, NJ, USA) and autoradiographed. The bands were quantified by scanning and densitometry. Quantitative determination of total ATP in cardiac tissue from animals in sham, T-H, T-H-RSV and T-H-sirtinol groups were performed by a bioluminescence assay (ATP determination kit; Invitrogen). The assay employed recombinant firefly luciferase and its substrate D-luciferin. Briefly, reaction solution containing luciferase and luciferin was plated and background luminescence measured. ATP standard solution or sample containing ATP was added to respective wells and luminescence was measured. After subtraction of the background luminescence, ATP concentration was deduced from the standard curve and normalized to total protein concentration. Plasma levels of tumor necrosis factor-α (TNF-α) were measured by enzyme-linked immunosorbent assay (ELISA), as described by the manufacturer (BD Biosciences, San Diego, CA, USA). Briefly, wells were coated with tumor necrosis factor (TNF)-α capture antibody overnight, after blocking, incubated with appropriately diluted standards or samples. The contents of the wells were incubated with primary antibody and streptavidin horseradish peroxidase conjugates sequentially followed by substrate solution. Absorbance was measured at 450 nm within 30 min of stopping the reaction. Statistical calculations were made by use of Graphpad Prism software (La Jolla, CA, USA). Welch’s unpaired t test was used to calculate significance between groups. Animals in the T-H group were divided into three subgroups. Whereas one subgroup served as control (T-H), the animals in the second subgroup received RSV (T-H-RSV) and those in the third subgroup received sirtinol (Sirnl) prior to RSV administration. After resuscitation, the animals were observed for 2 h, and left ventricular performance was determined by measuring +dP/dt and −dP/dt. 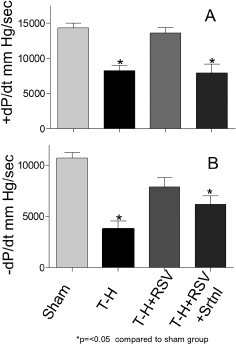 Both +dP/dt and −dP/dt significantly improved following T-H in the RSV groups (Figure 1). The markedly elevated dP/dt in the RSV-treated groups subjected to T-H shows the salutary effect of RSV in left ventricular functional improvement. Consistent with this observation, administration of RSV also improved heart rate following T-H (Figure 2). 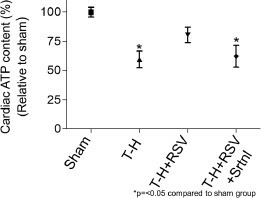 The beneficial effect of RSV was further indicated by declined plasma TNF-α levels (Figure 3) in the animals in the T-H-RSV group. 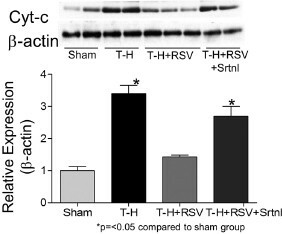 The salutary effect due to RSV on left ventricular contractility and systemic TNF-α level was abolished by sirtinol. Left ventricular function following T-H and RSV treatment. SD rats were subjected to T-H or sham operation. RSV or sirtinol was administered as described in the Methods section. Left ventricular function was measured 2 h following resuscitation and expressed in terms of positive (A) or negative (B) dP/dtmax; n = 4−6 in each group (mean ± SEM). Heart rate following T-H and RSV treatment. SD rats were subjected to T-H or sham operation. RSV or sirtinol was administered and rats were resuscitated as described in the Methods section. Heart rate of animals in each group is expressed as mean ± SEM. Plasma TNF-α. Plasma TNF-α was measured by using an ELISA kit as described in Methods. Results are expressed as mean ± SEM. As observed in our previous study (15), we found a significant elevation in cytosolic cytochrome c protein levels in the heart tissue from animals subjected to T-H. The cytosolic cytochrome c levels were significantly reduced in animals treated with RSV (Figure 4). Sirtinolpretreated animals demonstrated levels similar to those in sham animals. We also found that the significantly declined ATP levels following T-H were restored with RSV treatment, and pretreatment with sirtinol resulted in a significant decrease in ATP levels as compared with RSV-treated rats (Figure 5). Cytosolic cytochrome c. Cytochrome c was estimated by Western blot in cytosolic fraction of left ventricular tissue from rats subjected sham or T-H operation and treated with vehicle, RSV or sirtinol. The top panel (A) is a representative Western blot and the bottom panel (B) shows the results of densitometric scan of the bands. Values expressed in relation to β-actin were further normalized to sham levels and represented as mean ± SEM. Cardiac ATP content. ATP content was measured in left ventricular tissue from animals in each group (sham, T-H, T-H-RSV and T-H-RSV-sirtinol). Our previous studies have shown that T-H upregulates c-Myc irrespective of the age of the animal (29). In the present study we further confirmed the elevated expression of c-Myc following T-H, and in addition, its significant decrease in expression after RSV treatment (Figure 6). Notably, the decline in the expression level of the mitochondrial biogenesis factor, Pgc-1α, was also normalized after T-H in animals that received RSV (Figure 7). The effects of RSV on both c-Myc and Pgc-1α were significantly decreased by sirtinol. c-Myc expression following T-H and RSV treatment. c-Myc levels were tested by Western blot and the bands were quantified by densitometry. Left ventricular tissues from rats subjected to sham or T-H operation and treated with vehicle, RSV or sirtinol were used. Values expressed in relation to β-actin were further normalized to sham levels and represented as mean ± SEM. Pgc-1α expression following T-H and RSV treatment. Pgc-1α levels were tested by Western blot and the bands were quantified by densitometry. Left ventricular tissues from rats subjected sham or T-H operation and treated with vehicle, RSV or sirtinol were used. Values expressed in relation to β-actin were further normalized to sham levels and represented as mean ± SEM. RSV is reported to exert its effect through activation of Sirt1 (18). It also has been reported that Sirt1 can modulate c-Myc activity and c-Myc can alter Sirt1 expression (31). On the basis of these reports and our observation of elevated c-Myc expression with declined expression of Sirt1 protein following T-H, we tested the effect of RSV in modulating Sirt1 expression following TH. 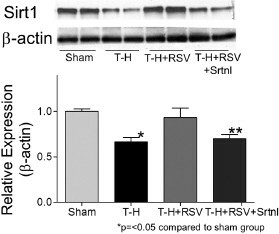 As seen in Figure 8, we found that RSV abrogates the T-H-induced downregulation of Sirt1 expression, with most of the effects abolished by the Sirt1 inhibitor, sirtinol. Sirt1 expression following T-H and RSV treatment. Sirt1 levels were tested by Western blot and the bands were quantified by densitometry. Left ventricular tissues from rats subjected to sham or T-H operation and treated with vehicle, RSV or sirtinol were used. Values expressed in relation to β-actin were further normalized to sham levels and represented as mean ± SEM. RSV has been shown to reduce oxidative damage, improve cardiac function and modulate inflammation in animal models of several human diseases (20,23,32). It is known that a major target of RSV is Sirt1 (33). The biological effects of RSV, including its reported effect in extending longevity in lower organisms, have been demonstrated to occur through activation of Sirt1, the NAD+-dependent histone deacetylase (18,33). We began to investigate the role of Sirt1 following hemorrhage on the basis of our findings on injury-induced alterations in the mitoscriptome expression profile, using the focused mitochondrial gene chip, RoMitochip (15,29). Severe hemorrhage is known to cause whole body hypoxia, and reoxygenation induces oxidative injury. In the animal model of T-H, activation of endoplasmic reticulum stress, mitochondrial dysfunction and a proinflammatory response have been reported (9,29,30,34, 35, 36, 37). Severe hemorrhage can result in systemic inflammatory response and multiple organ dysfunction leading to death (8). Our recent mitochondrial functional genomic studies using the RoMitochip led to the identification of a signature mitoscriptome profile in the rats following hemorrhage (9,38). We also observed that the number of genes significantly altered were fewer in aged rats compared with younger ones, and the expression level of individual genes was also altered to a lesser extent in aged animals following T-H (29). Among the genes that were altered, c-Myc was the most upregulated following T-H (29). On the basis of the results of our subsequent studies, which showed that upregulation of c-Myc is followed by decreased expression of Sirt1 after hemorrhage, we postulated that an inverse relation between c-Myc and Sirt1 expression may exist following hemorrhagic injury (15). The objective of this study was to test whether RSV, which is known to activate Sirt1, can improve cardiac function and alter Sirt1 levels following T-H. 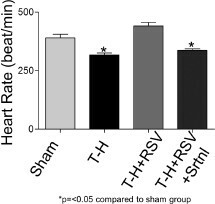 The results of our experiments demonstrate a significant improvement in left ventricular function following T-H in RSV-treated group (Figure 1). Simultaneous with improvement in cardiac function, RSV treatment resulted in decreased systemic TNF-α level and elevated cardiac ATP content (Figures 3 and 5). An exacerbated proinflammatory response following T-H is well documented (39, 40, 41). Our experiments clearly show improved cardiac function in RSV recipients, although the salutary effect of RSV is likely due to its effect on multiple organs and systemic inflammatory pathways. The benefits accorded to RSV as demonstrated by the increased total tissue ATP and decreased plasma TNF-α were reversed by sirtinol, indicating a Sirt1-mediated salutary effect in RSV-treated animals. Decreased cytosolic cytochrome c levels in rats subjected to T-H and treated with RSV suggest better preservation of mitochondrial membrane integrity, as opposed to the increased cytosolic transfer of cytochrome c observed in vehicle-treated T-H animals (Figure 4). This observation coupled with improved ATP content indicates that RSV enhances mitochondrial function following T-H. In addition, there was a significant increase in the expression of Pgc-1α, a mitochondrial biogenesis factor, in RSV-treated animals following T-H (Figure 7). Sirtinol pretreatment effectively blocked the effect of RSV in reducing cytochrome c release from mitochondria as well as in increasing Pgc-1α in T-H rats. As shown in Figure 8, we also observed elevated Sirt1 expression in the RSV-treated group. Though most reports on the mechanism of RSV-induced biological effects focused on its allosteric effect on Sirt1 leading to increased enzymatic activity, RSV is also reported to increase the expression of Sirt1 through unknown mechanisms (42). It is possible that enhanced Sirt1 expression, along with increased activity, may further augment recovery or Sirt1 upregulation and this may be the primary mechanism of RSV-mediated salutary effect. Furthermore, our results show decreased c-Myc protein expression following T-H in RSV-treated animals. More studies are needed to further elucidate the interregulation of c-Myc and Sirt1 following injury and its resolution. 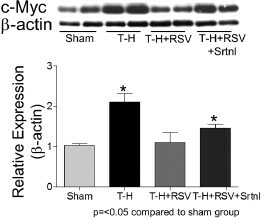 Sirtinol administration resulted in decreased Sirt1 expression and augmented c-Myc expression in T-H rats. However, it is noteworthy that sirtinol was unable to fully abolish the suppression of c-Myc expression due to RSV (Figure 8). This result might indicate that although Sirt1 could be a major mediator in imparting an RSV-mediated salutary effect, there could be factors independent of c-Myc contributing to the RSV-mediated effect (43). Our results further confirm an inverse relation between c-Myc and Sirt1 expression. Activation of Sirt1 by RSV may play a role in inhibiting the expression of c-Myc. c-Myc binds to Sirt1 promoter to activate its expression in neoplasia, suggesting an increase in Sirt1 expression with elevated c-Myc expression levels. However, increased Sirt1 may deacetylate and inactivate c-Myc, thereby resulting in a negative feedback (31). Following T-H, we observed that the increased expression of c-Myc was not followed by increased Sirt1 expression, demonstrating an inhibition of c-Myc-mediated Sirt1 upregulation. It is not known whether other activating transcription factors that bind to Sirt1 promoter are inhibited following injury and augmented following RSV treatment; there also could be direct inverse regulation between Sirt1 and c-Myc following T-H injury. Sirt1 has been shown to regulate transcriptional repression of mammalian target genes that are already basally expressed, and it has also been shown that Sirt1 localizes to promoters of several aberrantly silenced tumor suppressor genes (44,45). An important posttranslational modification by Sirt1 is deacetylation of functionally critical proteins such as Pgc-1α, MyoD, Ucp2, Ku70, NFkb, p53 and c-Myc (46, 47, 48, 49). Multiple feedback loops have been identified in the transcription of Sirt1 (47). The Sirt1 gene has a promoter that contains a CCAAT box and binding sites for nuclear factor-kB and GATA transcription factor (50). The presence of these multiple Sirt1 transcription-modulating proteins allows a fine balance in its expression and activity in response to intracellular cues such as hypoxia, or angiogenic and stress signals. It is important to elucidate how c-Myc-Sirt1 regulation is controlled by these transcription factors and influences injury outcome. c-Myc is an exquisitely regulated pleotropic transcription factor that regulates transcription of more than 1500 genes. Most of the studies on c-Myc-transcribed genes are in the context of cancer, although some studies have clearly demonstrated its overexpression following injury (51). Although cancer and injury may share certain biological characteristics such as hypoxia and inflammation, the regulation of genes following injury is expected to have a different signature; the c-Myc-modulated spectrum of genes has not been clearly defined (38,48,52). The results presented in this report demonstrate the salutary effect of RSV following T-H. Furthermore, effectiveness of RSV when administered after the onset of resuscitation provides a practical window of treatment in real emergency situations. Our experiments thus provide a fundamental framework to perform additional studies toward the use of RSV as an adjunct to resuscitation fluid following T-H. The study was supported by NIH grants AG 031440 (R Raju), GM R01 39519 (IH Chaudry) and a University of Alabama HSF-GEF Scholar Award (R Raju).